Proved out the look of the ground meshes and art-deco motifs for Rapture in this space with Level Builder Mike Snight and many other hands. Working alongside the Level Builders and Narrative team, we crafted this terrain mesh with custom recessed vents and light-shafts that our team could manipulate for events. A baby stroller modeled in the Streamline Moderne style for Burial at Sea under modeling lead Calen Brait. 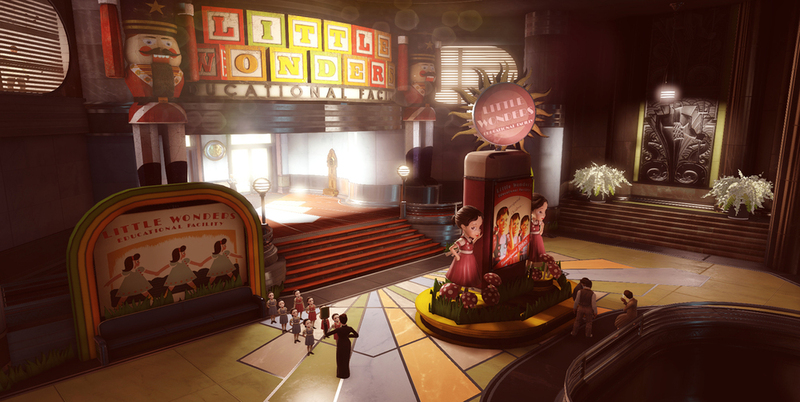 True to the Bioshock series, fun little nuggets of information and story are featured in the newspapers in and around Rapture.